For the first time, all of Humphrey Jennings' remarkable films are being newly remastered to HD and released by the BFI on three volumes in Dual Format Editions. Volume 2 gathers together five films from 1941 to 1943, including the iconic Words for Battle and Listen to Britain, that show Jennings at the peak of his tragically short but outstanding career. From the rousing call to arms of The Heart of Britain and Words for Battle to the poetic evocation of daily life during wartime in Listen to Britain and the powerfully resonating drama of Fires Were Started and The Silent Village, the films included in this volume offer a lyrical portrait of the nation at war and a moving celebration of Britishness. Widely considered to be one of Britain's greatest filmmakers, Humphrey Jennings (1907– 1950) is best known for films which beautifully evoke everyday heroism in times of war and peace. Combining poetic observation and humanism with a subtle yet intense national feeling that is also very personal, Jennings was a visionary and progressive patriot. 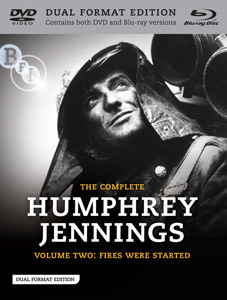 The Complete Humphrey Jennings Volume Two: Fires Were Started will be released as a dual format edition (containing both DVD and Blu-ray versions) on 23rd April 2012 by the BFI at the RRP of £19.99. 40-page illustrated booklet with essays, film notes and biographies.